Click here to go to Exercise part I, and part II. We’ve previously examined the terrific Women’s Health Initiative study. Close to 50,000 women participated in this study. The study group followed, a low fat, low calorie diet and increased their exercise by 10% over 7 years. In other words, they followed a conventional low-fat, calorie restricted Eat Less, Move More strategy. “Since this Eat Less Move More strategy failed so horribly, we should put hundreds of millions of dollars to promote it! I’m so smart it makes my own head spin. Let me go tell Barry”. We examined the Eat Less portion of this failed strategy in the Calorie Series. Now we’ll continue our examination of the exercise portion. Keep in mind that exercise is good for you. No doubt about that. But it is simply not that effective for weight loss. Over 90% of the battle against obesity should be focused on diet. Diet is Batman. Exercise is Robin. 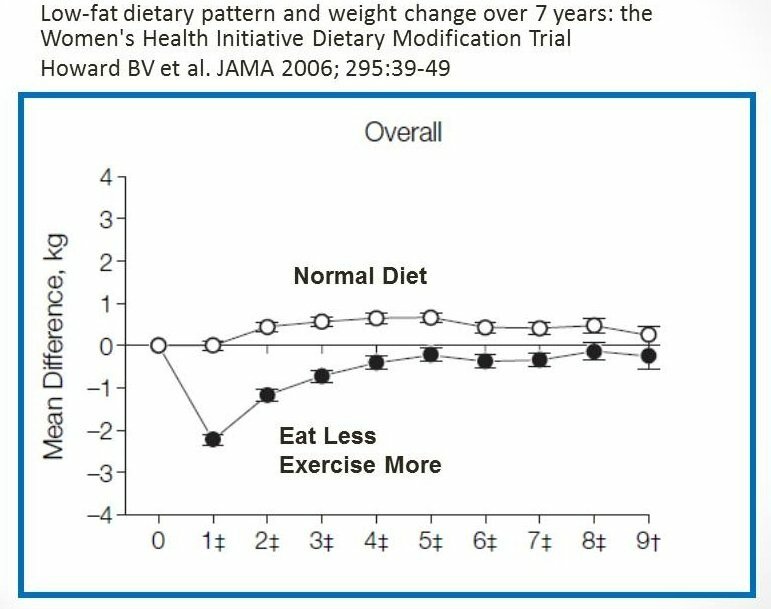 Recently, this paper “Physical Activity and Weight Gain Prevention, Women’s Health Study” published in JAMA 2010;303(12): 1173-1179 Buring et al, looked a little more closely at the exercise component of the Women’s Health Initiative study. They followed a group of 39,876 women from 1992-2004. They were grouped into 3 groups representing high, medium and low levels of weekly exercise. The lowest exercise group (<7.5 MET hours per week) corresponds to an exercise level of less than 150 minutes per week. The highest is more than an hour a day of exercise. 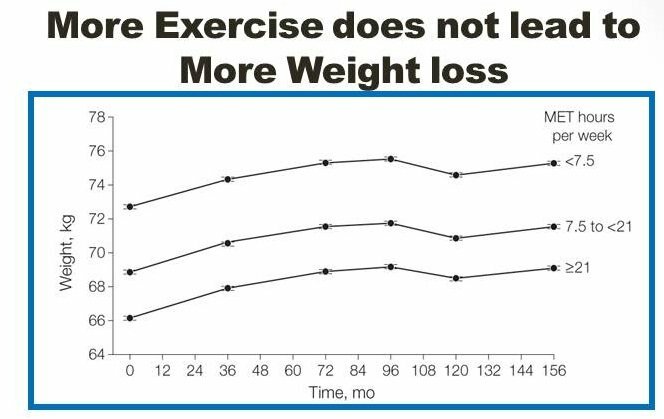 You might expect that those who exercised an hour/day compared to those exercising zero would lose more weight over the next 8 or so years. You might also be wrong. At baseline (time 0), you can see that there is a difference in weight between the 3 groups. The ones who exercised the most tended to be less heavy. So far, so good. However, looking over the next 10 years, there is no change in the amount of weight lost or gained between the 3 groups. The extra weight that you would expect to lose over any 3 year period is 0.12 kg or just over 1/4 lb. Yes, you read that correctly. If you exercise every single day for 1 hour for 3 years, you would expect to weigh an extra 1/4 lb. less than if you did nothing at all. In other words, daily exercise for 3 years will get you about the same weight loss as a good bowel movement. Yeah, I said it. Deal with it. Exercise is definitely good for your health in many ways. But it is not that good for weight loss. This is actually far from the only study showing this result although it is by far the largest. A recent 2009 study by Timothy Church in the Public Library of Science titled “Changes in Weight, Waist Circumference and Compensatory Responses with Different Doses of Exercise among Sedentary, Overweight Postmenopausal Women” found no difference in weight lost in groups randomized to different exercise intensities. Four groups were randomly assigned to different exercise intensities. There was no overall difference in weight lost. Interestingly, in the higher amounts of exercise there tended to be less weight lost compared to expected. 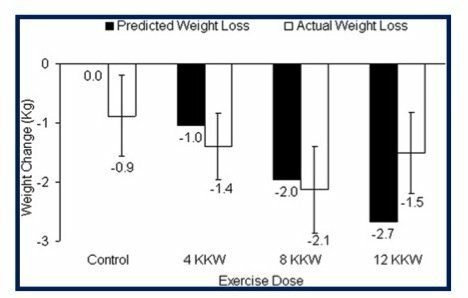 Another randomized trial of exercise “Exercise Effect on Weight and Body Fat in Men and Women” by McTiernan et al, Obesity (2007) 15, 1496-1512 showed minimal effects of exercise on weight loss. In this trial, 100 women and 102 men were randomized into two groups. Group 1 remained couch potatoes. Group 2 participated in 1 hour of aerobic exercise 6 days/week for 1 year. At the start, the men averaged 211 pounds and women 172 pounds. Reps. Sets. Cardio. Resistance. Spinheads. Yogatudes. Gun shows. Too many people in too tight pants. But hey, it’s worth it right? You go girl! After 1 year the average weight loss for women was …… 3 pounds. For men it was …… 4 pounds. Color me unimpressed. Exercise is just not that effective for weight loss. Endless chub rub (chafing between the inner thighs). Miles upon miles on the dreadmill. But so worth it, right? Average body fat loss for men ….. 5 pounds. Average weight loss for women …… zero. Oh, crap. That’s a bloody pain in the arse. Maybe all the fat turned into lean muscle. Sorry buddy – the study noted that “no change in body composition was observed”. In other words, the fat stayed as fat. In part 2 of the fantastic BBC series “The Men who Made us Thin” Jacques Peretti explores the link between exercise and weight loss. The exercise industry exists not to help you lose fat, but to fatten their own wallets. It is a machine to separate you from your dead presidents. Works pretty good, too. They know that weight loss is the major motivating factor for joining the gym. The reason exercise is not effective for weight loss is because of something called “compensation”. The body adapts in several ways to increased exercise. One major mechanism of compensation is to decrease activity outside of the exercise. The other major mechanism of compensation is to increase caloric intake in response to exercise. One of the dirty little secrets of the calories in calories out crowd is that as you increase exercise, caloric intake tends to increase. For proof, you can look at this article “Total energy intake, adolescent discretionary behaviors and the energy gap” in Int J Obes (Lond). 2008 Dec;32 Suppl 6:S19-27 by Sonneville KR, and Gortmaker SL. For every extra hour of exercise, the kids ate an extra 292 calories. Yes, compensation. Actually there are many, many studies that show the same effect. Or, you could use common sense. They don’t call it “working up an appetite” for nothing, you know, Einstein. The bottom line is this. Studies confirm that exercise, while healthy for you, is simply not all that effective in the treatment of obesity. Where can I find a reliable, detailed, scientific explaination of the health benefits of exercise? I simply do not trust anything published by the establishment anymore.